This option lets you change the default charset and collation for a database. New tables created after that will be created with the selected charset and collation unless otherwise specified. Default settings for existing tables and data stored in existing columns are not affected by this. It changes only defaults for the database and as such has only effect for future tables and data. 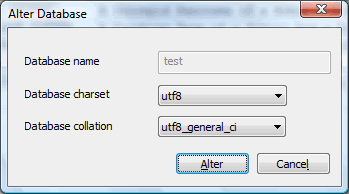 How to invoke the dialogue: Select Database -> Alter Database (or press F6 or use Database context menu) to alter database.